The EE4 REST API is a simple but powerful way to interact with Event Espresso. By providing an agreed, standardized programmatic interface between Event Espresso and the outside world, Event Espresso opens itself up to every other application and development environment on earth. 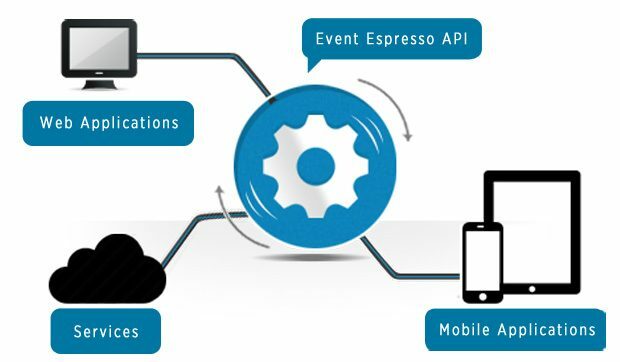 The Event Espresso 4 REST API is intended to allow client-side applications, and apps on different servers, to be able to interact with Event Espresso data. It is included in Event Espresso since version 4.8.29, and is built on the WP REST API included in WordPress since version 4.4. By providing an agreed, standardized programmatic interface between Event Espresso and the outside world, Event Espresso opens itself up to every other application and development environment on earth. In layman’s terms, an API or Application Programming Interface is an agreed set of standardized ways that a particular piece of software can be used; the rules defined for its interaction with the wider world, which govern how other pieces of software can talk to a program and how it will respond. In the image above, the term “tasks” is used to represent endpoints available in Event Espresso 4 such as events, tickets, registrations, venues, etc. Anytime an app uses Google Maps to display its location information. A mobile or desktop twitter client. A game/service that integrates Facebook features such as login, messaging, etc. In these instances, and all others like them, the APIs “expose” certain internal functions of the primary applications (Google Maps, Twitter, etc) so that outside developers can use them in their own applications or websites. In these examples, app developers have been given the ability to tap into the powerful features (and/or content) of major web services so that they can build on top of them and/or integrate key content and features into their own products, in clearly defined ways. This allows open collaboration to walk hand in hand with security. REST or REpresentational State Transfer is an architectural style of building APIs; not a code language or description of its function. A REST API is designed to provide a lightweight form of communication (less bandwidth) between a producer (ex: Twitter) and a consumer (ex: Twitter client), making it a reliable solution for high volume web services like Facebook, Google Apps, Twitter, WordPress, and now Event Espresso. In this case, you are the producer of content (event information and event data), and the applications you build can consume or use that data through the Event Espresso 4 REST API. Now that the REST API is in Event Espresso 4 Core, you can start developing great integration’s for your customers. All you need to get started is review the documentation and start building something GREAT! It’s built using the WordPress REST API (aka WP API). That means many plugins that work with the WP API work with it too. WP API gives the EE4 REST API a solid foundation by handling authentication, providing endpoint discovery, and supplying lots of the “behind-the-scenes” code. It provides read/write access to all Event Espresso 4 data: events, tickets, datetimes, registrations, custom questions and answers, payment methods, and configuration data. Even Event Espresso 4 addons’ data, like from the Mailchimp Addon or the People Addon, is available by default. If we’ve missed something tell us in the github issue tracker! If you still have questions about how to build your killer app that works with the EE4 REST API, open a ticket on our github repo. We’ll try our best to answer it, and improve our documentation too. Also you should stay tuned to our developer-specific blog at developer.eventespresso.com so you’ll know about any important changes regarding backwards compatibility or other developments. And what if you’re wanting to create/edit EE4 data over the API? Or have some other feature request? We want to focus on what matters most to you, so let us know! Chime in on our github repo’s issue tracker to let us know it matters to you! And if you do build something great with the EE4 REST API, consider listing it on our 3rd party addons page. If you have an REST API feature request, or bug to report, please let us know on our github repo. If you are building a WordPress plugin that will use Event Espresso 4 data server-side (in the PHP code), generally you do not need to use the API, and can instead use Event Espresso 4’s database models, config, and other modules directly. Check out developer.eventespresso.com for tutorials on how to use many of these systems. We make communicating with attendees easy with automated registration and payment confirmation emails.